Tobias Gilk is a noted expert in MRI safety, operations, best practices, and accreditation standards. He serves as senior vice president of RADIOLOGY-Planning, which designs radiology, nuclear medicine, and radiation therapy facilities for health care providers. He was formerly the president and MRI safety director for Mednovus, which manufactures ferromagnetic detection products. He has served on the ACR’s MR Safety Committee; is one of the coauthors of the ACR Guidance Document for Safe MR Practices: 2007; is a member of the Corporate Advisory Board for the Institute for Magnetic Resonance Safety, Education, and Research; and has written or contributed to hundreds of articles, presentations, and best-practice standards documents on MRI safety. 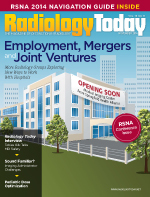 Radiology Today (RT): In a recent presentation, you said that quite a few facilities don’t have a clear big-picture view of what they should be doing in their MRI safety programs. Where should facilities start in developing or assessing their MRI safety? Tobias Gilk: It can seem daunting. A good place to start is to educate the physician that is your MR medical director and your MR safety officer, usually a senior technologist, about what MR risk profiles are and the alternative ways of responding to risk. For providers who want to tackle this on their own, but not bite off more than they can chew, I suggest that you take a risk-weighted approach. Identify the single greatest risk in your facility. If you’re not sure what that is, you might want to consider nationwide statistics on rates of injury. RT: What do those numbers tell us? Gilk: Precautions for implants and devices tend to receive the greatest proportionate amount of time, energy, and effort by MRI providers. While in no way do I want to minimize the importance of identifying proper safety screening approaches for patients with medical implants and devices, adverse events with such devices make up less than 3% of the MRI adverse events reported to the FDA. So what are the other 97%? Shouldn’t we be devoting many times that amount of time, energy, and effort to the other elements that lead to many more patients’ injuries? While I don’t believe that focusing on two or three items—to the exclusion of all else—creates a safe environment, identifying the weighting for the different risks provides a good place to start in what should be an ongoing process. The three areas that, when combined, represent approximately 95% of all the MRI injuries are burns, projectile incidents, and hearing damage. If we focus our attention on those three areas—again, not to the exclusion of all else, but if we double down on our efforts to identify and prevent these three types of accidents—we can make a huge impact on net patient safety. While we don’t want to cut corners on implant and device safety screening, we want to be effective and efficient in that screening so it doesn’t monopolize the provider’s time and allows for greater focus and attention on burns, projectile incidents, and hearing damage. RT: That sounds like the classic 80/20 principle. Gilk: Yes, but in this case it is 95/5. RT: Let’s start with burns. Your presentation at AHRA last year included the statistic that 69% of MRI exam-related injuries reported to the FDA were burns. What should providers be thinking about and doing to minimize those cases? Gilk: One of the first things we need to recognize about MRI-related burns is that even though the injuries may look very consistent, there are actually three main causal roots. If we don’t address each of the three causal roots of MRI burns then we’re not effectively minimizing that risk. The first way patients can receive MRI burns is if they touch or are too close to the transmitting radiofrequency (RF) coil elements. There’s an opportunity for focal heating if the body part is touching the transmitting coil. Second, burns can occur if patients have any electrically conducting materials with them or on them while they’re in the bore; items such as EKG leads or even contemporary workout clothing that is labeled “antimicrobial,” which means it has silver-impregnated materials in the fabric, can become an electric conductor and run the risk of heating and then burning the patient. The third cause is called large caliber body loops. We see burns reported where, for example, there is a small blister on the thumb of the patient and one on his or her thigh. Each burn is a small area of skin-to-skin contact that completes the large caliber body loop. With a thumb-on-thigh burn, the loop essentially goes from the thigh up to the torso, across the shoulder, and down the arm. That small area point of contact where the thumb touches the thigh is the point of greatest electrical resistance in that loop. The electrical current repeats and the patient ends up with a burn. Anytime we see so-called kissing burns, two body parts were touching during the MRI and created another opportunity for a burn to occur. So if the only burn precaution that a site takes is putting padding between the patient and the bore wall to prevent the first type of burn I mentioned, the provider is ignoring about 60% of causes of patient burns. If the site and the technologist staff don’t understand all three different ways in which burns are caused, they can’t possibly take the appropriate preventative steps. RT: What are those three steps? 1. Provide the bore padding. When you have a patient in the bore make sure there is a minimum of 1 cm of air space or padding that keeps that patient from touching the transmitting RF coil element. 2. Make sure your screening process considers nonferromagnetic conductive materials that might find their way into the MR suite. If a patient is wearing workout clothes that appear safe from a ferromagnetic standpoint, make sure their clothing, especially workout clothing, is not impregnated with antimicrobial metals that can create burns. Similarly, for patients who come down from other floors for exams, make sure that things like pulse oxygen leads, EKG leads, telemetry equipment, and anything that comes down with the patient is removed before putting them in the bore. If something must stay on the patient, make sure it is appropriately positioned and insulated from the patient. For example, if you need to maintain an EKG lead, simply make sure that there is a folded towel or something that keeps the lead separated from the patient’s body. Remove conductive materials that are unnecessary, but when something must go in the tube, position it correctly and insulate it from the patient. 3. To prevent large caliber body loops, avoid skin-to-skin contact or at least small areas of contact. If a patient has their arms folded over their chest, that skin contact covers a larger area and we tend to not see burns in that type of situation. It’s with the small point of contact, such as the thumb to the thigh or a thumb on the opposite ears when a patient’s arm is extended over his head, that these burns tend to occur. So position the patient; pad the patient; screen the patient; and remove any electrically conductive material. If you do those three things you will eliminate 97% of all reported burns. RT: When these burns occur, do patients feel the pain and tell the technologists? Gilk: That’s a great and relevant question. We’re accustomed to burns causing pain, to the point where someone will say, “Ouch, I touched something hot.” That reaction to something hot is instantaneous and we reflexively pull away. That does happen if we have an electrically conductive material, such as an EKG lead, because the lead heats up and then we have that hot thing in contact with the skin. So one of the three different causal roots of MRI burns happens that way and the patient will sense something’s heating up and alert the technologist. However, with the other two causal roots—coil contact and the large caliber body loop—the vast majority of patients don’t know they’re being burned. That’s because, we believe, those burns are not happening at the skin, but in the fatty tissue immediately below the skin where there are not pain sensors. Patients can actually be burned and until that burn damage has an opportunity to propagate through the skin there is no sensation of pain and no initial observable evidence of a burn. A good example of this risk was a patient whose calves were very lightly touching during the scan. After the MRI exam when he was removed from the bore he said everything was fine. He said the only odd thing was that the inside of his calves itched. The technologist had the presence of mind to say, “If you’re not in a rush, could you stay a little longer? We want to make sure there’s nothing going on with that itch.” During the next 30 minutes they watched that itch turn into a first-degree burn and then to a second-degree burn with blisters erupting on the skin. The notion that we give patients squeeze balls and tell them, “if you feel like you’re getting too hot, squeeze this and we’ll stop,” doesn’t help prevent certain kinds of burns. These kinds of burns can be prevented, but by the time that we react to something we think is happening, the damage is done. If you read some of the FDA accident reports describing burns, often the imaging provider reports receiving a call the day after an exam. The patient came in, had the MRI, left, and then that evening felt two painful spots and wondered what they were. Those spots were not there in the morning before they had the MRI, nor when they left the facility. The patient then sees his doctor, who asks what he had done, and the patient says he had an MRI. The report then gets filtered back to the MRI provider. The patient had no idea how the burns occurred so it becomes this detective case to find out. The MRI provider is wondering why the patient didn’t say anything at the time of the scan, but the patient didn’t feel any pain at that time. These burns are still preventable if providers are aware of how they’re caused and take the effective preventions as part of everyday practice. RT: Projectile incidents accounted for 12% of reported injuries. There have been some prominent cases, and you see dramatic photos of items such as wheelchairs and floor polishers drawn into MRI bores. How do you approach these concerns? RT: What are those interdiction steps? Gilk: The three things every site can do to prevent projectile accidents are, first, implement the ACR four-zone model that only permits access to the MRI area to people with appropriate staff training. This way, we don’t let people into the MRI room unless they have specific training that prevents them from being a hazard to others. Or, in the case of a patient or visitor, that person is under the direct supervision of somebody who has such training. The second thing you can do to prevent projectile injuries is to test and label all equipment and material that lives within the MRI suite or is frequently brought into the suite, including items involved with transport and housekeeping. Identify and label the safety conditions for these items. I think that it’s wise to minimize the amount of ferromagnetic materials used in a supporting role within the MRI suite. The fact is that ferromagnetic material is so ubiquitous that it’s foolish to think we can readily manage it in the controlled access area of the MRI. In a completely nonferromagnetic environment, where the stapler is made out of plastic, we then only need to readily identify the safety properties of materials not kept in the MRI suite by using the American Society of Testing and Material International conventions of MRI safe, MRI conditional, and MRI unsafe. Labeling materials and objects and understanding the information about safe use criteria is terribly important. The third important element is using a ferromagnetic detector to prospectively identify concealed or unknown ferromagnetic material before it’s taken into the MRI suite. Building codes require ferromagnetic detection in many states but are usually only applicable for new construction. Typically, the codes do not retroactively apply to existing facilities and mandate ferromagnetic detectors. We’re approaching the tipping point where it just seems to make regulatory sense to require ferromagnetic detectors for all systems. I believe that we long ago crossed that threshold in terms of detectors’ effectiveness in preventing accidents and injuries. Hopefully, the regulatory and accreditation criteria will catch up with what is necessary to prevent injury to the patients and the technologists, who comprise a significant portion of the projectile injury reports. RT: To what extent are technologists victims of projectile incidents? Gilk: Think about this common situation. A patient in a wheelchair arrives and receives an MRI exam. Typically, for patients who are in wheelchairs but still have some mobility, someone brings the patient close to the door of the MRI room and locks the chair’s wheels. The technologist will then help walk the patient the 10 feet to the MRI table. Next, imagine the technologist has completed the exam and the technologist is helping the patient off the table when the transport person or maybe the patient’s family member is there to take the patient home. They see mom, dad, or whoever unsteady on their feet with the technologist assisting them and want to be helpful so they come into the room with the wheelchair. Now, both the patient and the technologist are between the chair and the scanner. There has been more than one instance of the technologist trying to use their body to shield the patient—stop the object—and becoming the victim of an MRI projectile injury. RT: Hearing damage represented 11% of injury reports, according to one of your presentations. This issue seems like it should be easy to address. Gilk: The good news is that the majority of MRI providers offer hearing protection to their patients the majority of the time. The bad news is that we’re still seeing acoustic injuries in patients even with the option of hearing protection. There are a few reasons for that. But first, it’s important to note that some of the new technology such as Silent Scan or Whisper Mode, depending on the vendor, can dramatically reduce the sound pressure level for those particular sequences. They are tremendous assets but are limited to a finite number of scan protocols on a small number of contemporary machines. The vast majority of scanners out there have no such protection built into the scanner. The sound pressure levels in various MRI machines are known to be at levels that can cause hearing damage. It can be just temporary, but there are claims of hearing loss or tinnitus as a result of exposure to the extremely loud sound pressure levels in MRI exams. So providers need to do more than simply make hearing protection available to patients. You need to encourage them to use it, even going so far as requiring them to use it unless they sign an informed consent document saying they understand that there are risks of hearing damage if they refuse to use hearing protection. Being more assertive in the importance of hearing protection is one element. Second, those compressible foam plugs that are pretty ubiquitous at MRI provider sites aren’t very easy or very intuitive to use correctly. Technologists need to educate patients on how to use earplugs correctly. They must know whether patients have inserted them correctly in their outer ear so that they get the desired effect. It’s not enough just to see the plugs sticking out of patients’ ears. I recently learned a simple way to verify the effectiveness of foam earplug hearing protection. Ask the patient to cup their hands and cover their ears. If they can tell a difference in the sound between when they cup their hands over their ears and when they remove their hands from their ears, that means they don’t have the hearing protection in correctly. Train techs to teach patients to use the plugs and have the patient verify that the hearing protection is doing what it’s supposed to do before beginning the sequence. Also make sure alternative means of protection are available. The earmuff-type protection is uncomfortable for some people and there is an issue of infection control because they have to be wiped down, which creates another step in the process, but there are patients who have a hard time getting those foam earplugs to work. RT: Burns, projectile incidents, and hearing damage cover the vast majority of reported injuries, but as you’ve said, those pieces alone don’t constitute a complete MRI safety plan.